Freshly made fettuccine tossed in olive oil and Italian seasonings and topped with a medley of Alaskan seafood sautéed in olive oil, garlic and tarragon. Tarragon has long been among our favorite all-around herbs for many seafood dishes, and it really shines in this simple-to-prepare entrée. Sometimes referred to as dragon’s herb or dragon’s-wort, tarragon adds a gentle sweetness that hints at anise or fennel, but is more subtle. The basic dish evolved from a piece of advice an older gentleman – an immigrant from Italy – shared with me some years ago when he observed that in his opinion the best tasting and easiest pasta dish is made by sautéing chopped garlic in olive oil and tossing the pasta in that and nothing more. Perhaps a little basil, marjoram or oregano might be added, he allowed. 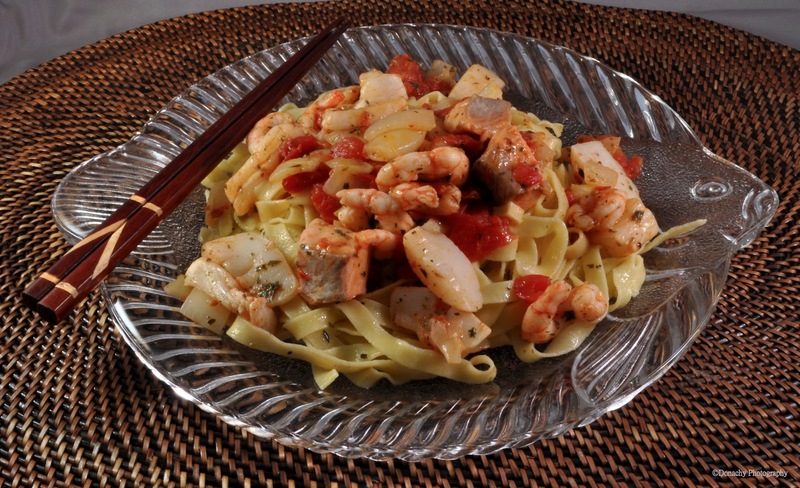 In this dish, I’ve added chopped sweet onion, tomatoes and three kinds of seafood to the olive oil and garlic. Tarragon, sea salt and freshly cracked pepper flavor the seafood. When I lived in South Carolina, I used to make this dish with white shrimp which I was able to cast a net for, and instead of salmon, I used freshly caught striped bass or pompano. Drain pasta. Place in large bowl. Add olive oil and herbs and toss. equal portions of wild salmon fillet (skin removed, or not), sea scallops and shrimp. Use about 1/4 pound seafood per person or slightly more. Cut salmon into 1/2-inch to 3/4-inch cubes. Slice sea scallops into 3 or 4 slices. Peel and devein shrimp. In a bowl, mix together seafood, garlic, tarragon, sea salt and pepper. Set aside. Add olive oil to a frying pan and heat over medium-high heat. Add onions and cook for two minutes, stirring occasionally. Serve pasta. Top with seafood medley. Add additional ground pepper, grated Parmesan, pine nuts or a sprig of fresh tarragon. Enjoy this with a crisp, well-chilled sauvignon blanc. This looks and sounds divine! Thanks, Amy. This recipe could be modified to work with freshwater fish such as crappie or catfish instead of the salmon.